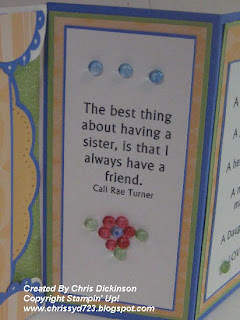 Tomorrow is my little sister's birthday. 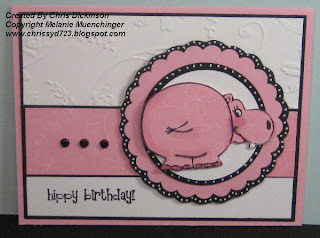 My friend Holly generously sent me some of these ADORABLE stamped images from Rachel Ann Miller's collection. My sister is a few years younger than I am, but I can't help but tease her about her age. When I saw this stamp, I couldn't resist making this card for her. For the sketch, I used SCS Sketch Challenge #96. 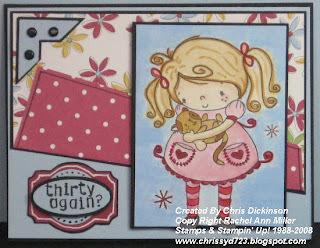 Stamp Sets: Rough Edges Alphabet by SU, Lilly Cutie by Rachel Ann Miller stamps. Bloggers Challenge #49 - ANIMALS! This card is Beate's Weekend Sketch Challenge and I used the White Gel Pen for the eyes, tooth and dots so it will qualify for this week's Belli Challenge! 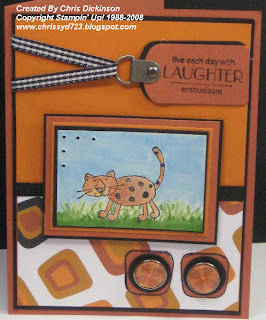 here is another card for the bloggers challenge! I have received several e-mails and requests as to how I use my Layer Ease. I decided today that I would pull it out and make a tutorial. 1. 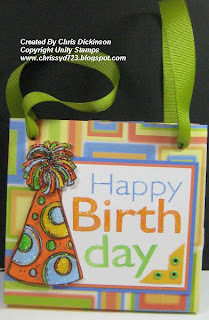 Adhere image or shape of cardstock that you want to mat. Make sure any angles or edges are firmly held down. If they are not taped down well, your pencil will slide. 2. Choose your disc size that you want to use for your mat or multiple mats. 3. 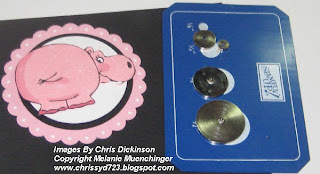 Line up your disc and insert your pencil in the hole. 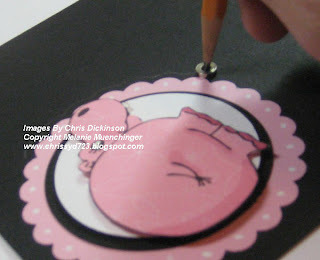 Slowly roll your pencil tip along with the disc around the image your are outlining. 4. You will have a completely traced image when you are done. 5. Carefully cut around on your pencil lines. When you are finished, erase any remaining lines. 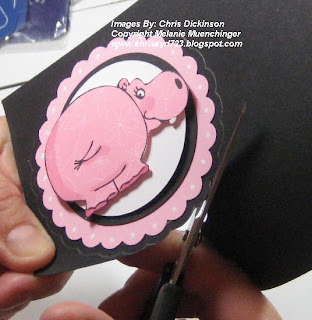 Tip: A shorter blade on your scissors helps you cut more accurately. 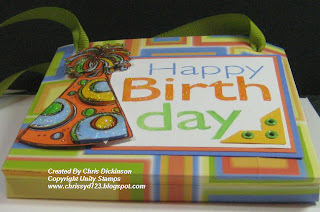 This is a Double Pocket Bag I made using Unity Stamps Birthday Confetti Stamp set. I am loving the versatility of it. 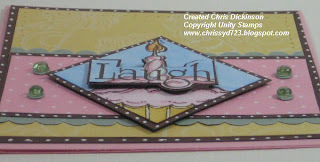 This stamp set is a fun Birthday set! The technique was a new one for me and I even had a chance to use my *NEW* Scor-Pal tonight! I was so excited to pull that out and play with it! The directions for the Double Pocket Bag are from Splitcoast Stampers. On the Tassle portion of the hat - I cut between the tassles and put in different areas - to give it different dimension - one to two dimensionals to pop it up at different heights. I took a few different pictures so you could see the different heights. I also popped up some of the circles on the hat. This is is a new stamp set of mine from Unity Stamps! 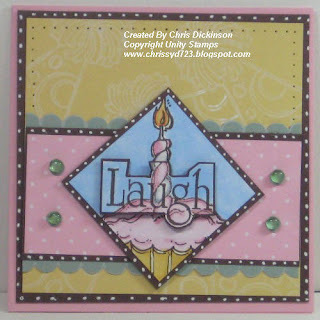 I am loving it - it is a fun image to stamp with and the possibilities seem endless. Thank you for looking! Have a blessed day! This Weeks Belli Challenge is the WHITE GEL PEN. Let your imagination go wild! Make a completed project using the gel pen in a different way and share the link here in the comments linking to my Blog and CBC19. 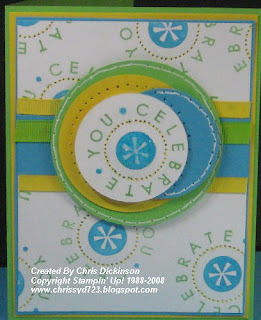 When you post to Splitcoaststampers or to your Blog, be sure and put CBC19 as the KEYWORD and mention of the challenge! 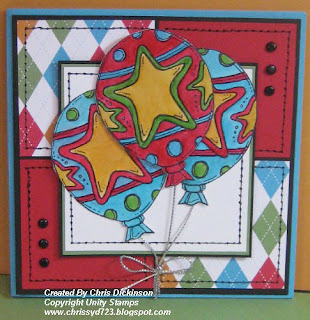 The winner will recieve a stack of Stampin' Up! cardstock in assorted colors. Deadline to make a comment with the upload and do the Challenge will be on Monday evening. A random drawing will be held on Tuesday and the winner will be announced on Wednesdays! Thank you for looking and playing along! 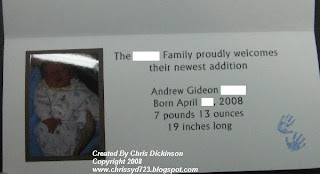 One of my dear friends just had her 6th child, so I made her birth announcements for her. 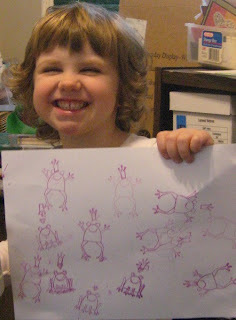 She wanted something fun and whimsical and she needed 60 of them. 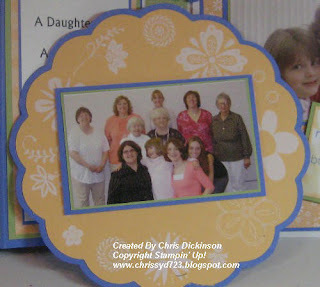 I used the All in the Family stamp set from Stampin' Up! and the alphabet jumbo wheel. I deleted the family name along with the birth date out of respect for our friends. The inside I formatted in Microsoft Word to print and included the baby photograph. The hand print stamp set, I picked up from Hobby Lobby and do not know the name of the company that makes it. Thank you for looking! Have a great week! Ever since my son was 4 years old, he has had a passion for making his own costumes out of construction paper. Yesterday, he made this dinosaur mask and did not want to put his face inside it - He kept telling me - Mom, the mouth is supposed to go OVER his eyes. Well, I thought it would be cute to have his face inside the open mouth, so to amuse his mother, he pulled it down for me. When I stamp, I do not get time ALONE. There is ALWAYS some one lurking nearby. This weekend, I have been making 60 Birth Announcements for a friend and I had some extra bodies stamping near me. All day long I hear, Mom, can I have a Dum Dum? Oh Mom, can I have a Dew Drop? Or even and most frequently requested, Mom, May I please have a Tic Tac? My 8 yo son has started the Goofy Face stage - not to mention my 3 yo who scrunches up her nose. Cuddlebug Smoosh, Pencilled Twinks - Techniques Galore! 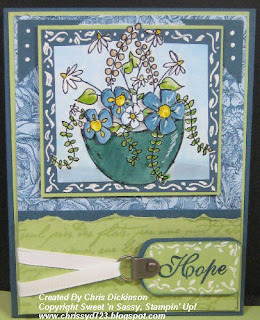 Oh - I will throw in another - it was a sketch from the Featured Stampers Challenge on Splitcoast too. 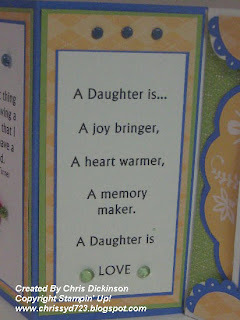 Here is the card I cased. For more information on the Technique Junkies newsletter click here. 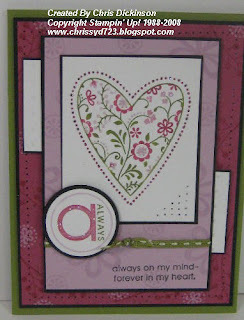 Today is the Featured Stampers Challenge #68 on Splitcoast Stampers. Peanutbee is the Featured Artist this week. She has a fun, clean style. I love her gallery. What you do for the Featured Artist Challenge is take a card from their gallery and make it - changing two or more things. HERE is the original card that I CASED. 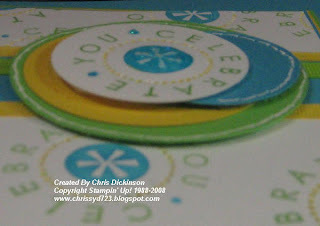 Then I changed the stamps to Unity Stamps Birthday Confetti set. 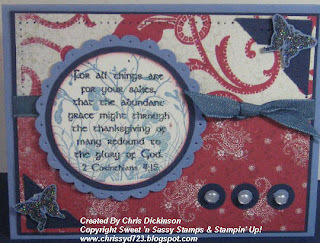 I changed the colors to Stampin' Up!s East Coast Prep, Real Red, Tempting Turqouise, Whisper White, Basic Black, Wild Wasabi. I also changed the ribbon on hers to brads. I used the Paper Piercing Tool and the Mat pack, along with a black marker to connect the dots! I love the vibrancy too! I used the Copic Markers to color the images. This weeks Blogger's Challenge is to use Red, White and Blue - I combined this since I am so tardy, with Beate's weekend sketch challenge. Sweet 'n Sassy Stamps posted a contest in their yahoo group to make a Sack Purse this week - so this was my take on the gift sack! I cut grass blades using my Paper Snips with Garden Green and Old Olive cardstock. That is more work than I thought it would have been! The handles for the bag are Twill. 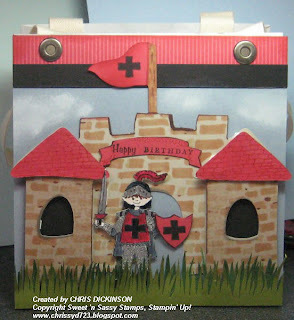 The stamp set is from Sweet 'n Sassy stamps called Knight In Shaining Armor. 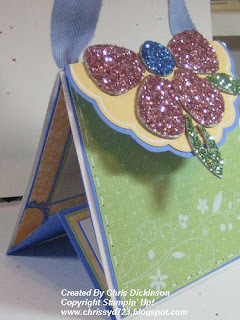 Accessories: Paper Piercing Tool, Mat Pack, Markers, 2 way glue pen, Dazzling Diamonds, Dimensionals, Olive stitched ribbon - this is by Making Memories - Cuttlebugged cardstock is from my friend Joan - I think I NEED a cuttlebug! 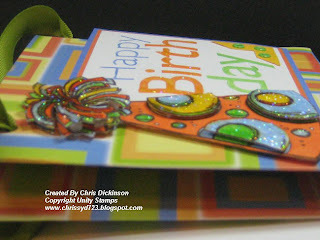 This Weeks Belli Challenge is your Paper Piercing Tool. Let your imagination go wild! 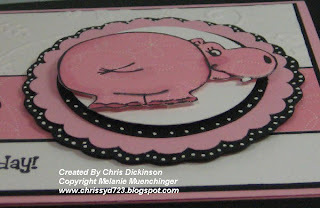 Make a completed project using the paper piercing tool in a different way and share the link here in the comments linking to my Blog and CBC18. 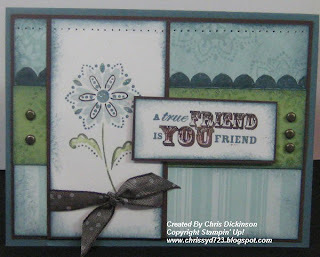 When you post to Splitcoaststampers or to your Blog, be sure and put CBC18 as the KEYWORD and mention of the challenge! 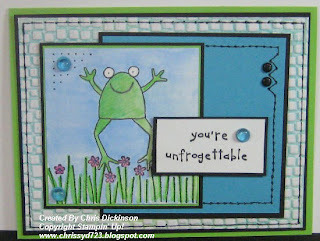 The winner will recieve a stack of Stampin' Up! cardstock in assorted colors. Deadline to make a comment with the upload and do the Challenge will be on Monday evening. A random drawing will be held on Tuesday and the winner will be announced on Wednesdays! 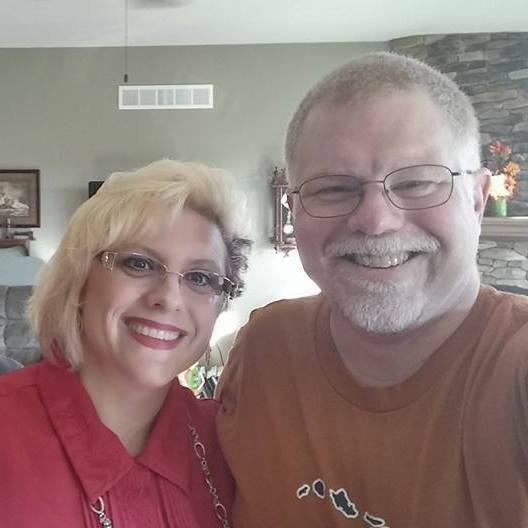 This week Liz Miller has won the drawing. Congratulations! Check out Liz's beautiful Book mark that she made! Thank you for participating! I did TWO challenges with this one! 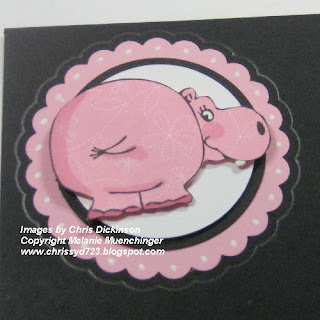 Splitcoast Stampers Sketch Challenge 166 and their Color Challenge 167! 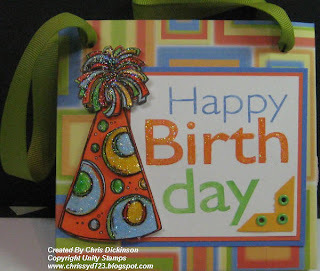 This is a special card for my dear friend's birthday...Now to get it in the mail. I stamped the Chocolate Taffeta Ribbon using the Itty Bitty Bg's and the Whisper White Craft Ink - to make some polka dots. There is a close up here for you to view it. I also colored the image using a Blender pen and Blue Bayou, Soft Sky, Certainly Celery, Chocolate Chip and the Always Artichoke Markers. I used the same color cardstock. 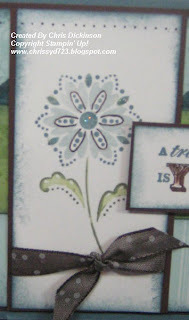 I also stamped the All Scallops above the certainly celery cardstock with Blue Bayou ink. I did not line it up perfectly, so took a Blender Pen and filled in the edge I missed. Patty Bennett inspired me after seeing her Carousel Note Purse to make one of these -However - the bad news was I didn't have the Carousel Note Cards - BUT I did have the Mini Monogram Font for my Cricut that has a scallop on it, so I set it at 5.5 and then used my Layer Ease to layer it and make it big enough. Since my Carousel Note only measured to be 5.75", I had to be a little creative and change the measurements. I also didn't have the envelopes for the Carousel Notes, so I had to use the Medium Square envelopes which measure 5.5"x5.5" by Stampin' Up!. 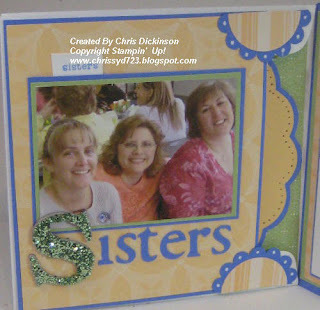 My friend Holly, challenged me to make something using the Chipboard and Chunky Glitter from the Spring Occasions Mini I hadn't cracked open yet. 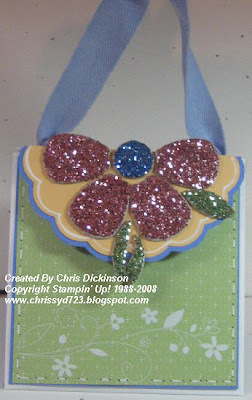 You can find the directions to the Carousel Note Purse on Jan Tink's blog. Like I said before, my measurements are a bit different and I added pictures! As I was making it, I thought I should have a COMPLETED project for once instead of just leaving it blank. I used the Cricut for this - so I am adding it to the collection for the Belli Challenges! Do not forget to Check out the Wednesday Belli Challenges - post your participating entry for a chance to win! 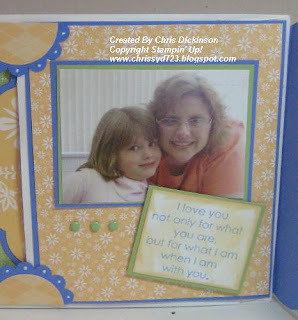 A special thank you Patty Bennett and Jan Tink for the inspiration and help with the tutorial! Another Double Pocket Card - Chocoholic! Waxy Cuddlebug Technique - Guess hoooo? 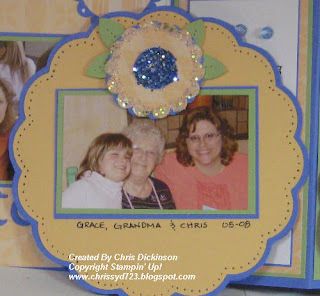 Inspiration Challenge 126 - Hippy Mother's Day!